Do you remember the popular column "Ask Boaz" in Kuensel K2 Mag? Well ‘Ask Boaz’ was for more than four years the favorite tech guide and information source in Bhutan, which ran as regular column in Kuensel’s weekly K2 magazine. Boaz Shmueli would answer to questions sent in by his readers with surprising wit and simplicity. Over the years, the column subtly became the most authentic history of technology in Bhutan. 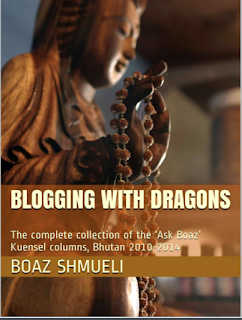 Now the complete collection of his articles from ‘Ask Boaz’ column is put into a book "BLOGGING WITH DRAGONS" and if you are quick enough, the ebook version is on Amazon.com for free these days (Click on the Picture). 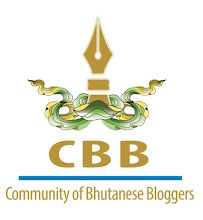 As I read flip through the pages I am transported down memory lane- the times we struggled with Dialup connection to the wake of Facebook on 3G network, technical nitty gritty to online security and media literacy, KB days to coming of TB, … The book is the most authentic biography of technology in Bhutan. It can give a very authentic insight into the lives of people of the Bhutan, and the gradual change we underwent in the short span of time. The book is a legacy of a foreigner who lived a meaningful life in Bhutan and impacted everyone who owned a computer, tablet or phone. The book can still be a helpful ‘how to’ book in Bhutan and similar countries. It can be a useful technology guidebook for anybody living in or travelling to Bhutan because we are still faced with the questions that Boaz answered years ago. The writer Boaz Shmueli is also the author of Thimphutech.com and Creator of android app BhutaNews. Good review. I love this since it now comes as a collection - everything in one piece. Those days, I would be looking forward to what Boaz would in store for us that weekend. Always a treat. Thank you, Boaz for all this and more.